It was hard to pick which of the dozens of photos I got of these turkeys to post... this one shows them as they approached my car. I snapped away for a second more but then started to feel a bit alarmed as they were coming straight at me - I rolled up my window and kept on shooting. I think they were domestic, not wild, on a little outing! The probably feel safe, what with Thanksgiving so far away, lol. Hello nosed buddies, please don't attack our lady from Sharon, we need her to post some photos! la chasse au dindon est ouverte? Hi Jenny, you have all kinds of funny animals...cool! Nice! You know, I have'nt seen a live turkey in my life before. Thanks. They look hilarious at this time of year - their heads are bright blue, they have long fleshy things called "snoods" hanging down over their beaks, and I wish I could play you the little video clip I took of them gobbling all together! 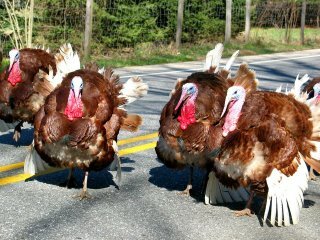 Well thats the first time I ever seen a convoy of Turkeys roaring down the road! :) Cool photo! Thanks for your nice comments on my blog! Great stuff here as well! Just stumbled over your blog in a comment elsewhere, and what do I find... a blog from the old home. I'm out on the West Coast now, where I was born just after the last mammoth passed, but I grew up in Connecticut, Riverside to be precise. We used to come up to Sharon for church retreats. I loved it up there. Nice shooting, I'll be back. cool photo...not often you see turkeys crossing the road...they'll have to change the old jokes! Thay were proberbly on an 'anti-Christmas and Thanksgiving' march!! What a great photo. Here in Missouri I see them often but they are VERY shy. Turkey are the hardest bird to hunt becuase they can see color, making them very smart. Thanks.